Why is this picture unusual? Because it was taken around 9:15 this morning. So why are we having hamburgers for breakfast? Because it's Backwards Day. That's right. We're doing everything backwards today. 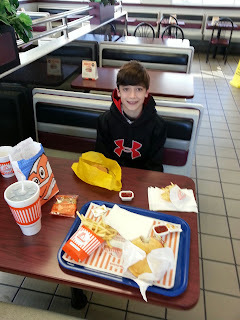 So we got up at 7:30 (Eli 11.5 slept in), watched hockey (the semi-finals of the world junior hockey championships started at 3 a.m. this morning, fortunately, so we taped the game), went to have dinner at Whataburger, and now we're at roughly early afternoon. I'm going to work in the afternoon, we're having breakfast for dinner, and we'll probably watch cartoons before Eli goes to bed. We've been talking about doing this for two years, but never got around to it until now. The only difference is that two years ago, Eli would have been wearing his clothing backwards, too.